To see more photos taken at the Old Hartley School on this day, click on the image above which links to the SmugMug gallery. On 25 May there was a day of celebration at the Hartley School, with bands, poets, songsters, market stalls, a Lions Club barbecue and much more from 10am until 3.30pm. Presented by the combined service clubs of Lithgow led by the RSL, this was a highly popular day out for the family. Maree Statham, the Mayor of Lithgow City Council, was in attendance along with a large number of people from the Hartley Valley, Lithgow and beyond. In addition to all that was happening on the ground, the school was a flyover point for the Blue Mountains Crossing Bicentennial Flyover, an historic array of planes including the famous RAAF aerial acrobatics team the Roulettes and a C-130 Hercule to the Red Radials flying in formation organised by the Blue Mountains as a principle element of their bicentenary celebrations. THE celebrations marking the bicentenary of the European crossing of the Blue Mountains took to the sky on Saturday with around 70 military and civilian aircraft taking part. And while crowds turned out at vantage points everywhere along the route of the aerial armada there was no doubting it was the RAAF’s brilliant aerobatic team, The Roulettes, that they all wanted to see. 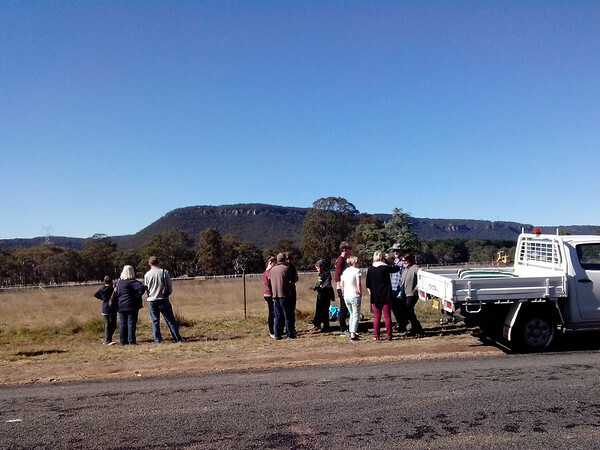 Around the local area the most popular vantage points seemed to be at Hassans Walls, Hartley School, Mt York and at Blackheath and the spectators were not disappointed. Some, however, did express disappointment that at some viewing locations the aircraft other than The Roulettes were too high to be fully appreciated. That aside, it was a brilliant success story even if the numbers failed to reach the lofty heights of the 300 or so aircraft originally envisioned. Further down the Blue Mountains the pedestrian overpasses spanning the Great Western Highway provided popular viewing platforms. More than 70 aircraft flew into history when they took part in the largest civilian flyover in Australian history a spokesman for the organisers said yesterday that thousands had flocked to 11 public viewing sites to witness the 75 aircraft fly overhead to mark the bicentenary of the first recognised European crossing of the Blue Mountains by Blaxland, Lawson and Wentworth in 1813. The two-and-a-half-hour aerial spectacle included the famed RAAF Roulettes aerial acrobatic team, a C-130J Hercules, Beavers, a team of Russian Yaks, gyrocopters and everything in between. Joining in the fun were descendants of Blaxland, Lawson and Wentworth, who flew over the same route blazed by their famous relatives two centuries ago. Visitors even watched the 75 planes take off from Bankstown and Richmond and the ones that landed at Bathurst. Blue Mountains Lithgow & Oberon Tourism (BMLOT) chairman Randall Walker said the officialregional tourism organisation was thrilled to support the Flyover. ”I commend Philip Hammon, the visionary behind the concept, and event director Matt Hall for organising an outstanding and fitting event to mark the bicentenary. “Philip’s dream of a large scale spectacle, complete with descendants and free to the public has been realised,” he said. I had a market stall at Hartley School and the day was a great success, not only for me but for the other stall holders. It was great to see the crowds and to have such a great view of the flyover. Thank you to John and Carol Barlow, Lithgow RSL and Lions Club and all the other people that were involved in the organisation of such a great day !! Thank you Trish for your feedback. It’s always good to know that others have enjoyed our events.